Grace United Methodist Church is involved in a number of mission projects locally, around the state, the nation and the world. Much of our mission work is coordinated through our “Grace Cares” committee. Our United Methodist Women group is also involved in mission projects. Here are a few of the mission projects that are near and dear to our hearts. If you would like to support any of them, use the PayPal donations section of our “Tithes and Offerings” page. Homemade Laundry Soap is made available at Grace United Methodist Church. It’s made from natural ingredients–no dyes, no scents, to fancy chemicals. And it’s FREE! Just pick up a jug in the coat area by the front door! We distribute Thanksgiving and Christmas baskets during the Thanksgiving and Christmas holidays to those who are in need. If you would like a basket or know someone who could use a little help for the holidays, go the the “Contact Us” page on our web site and send us your information. Be sure to leave a phone number so we can contact you! Hawkeye Harvest Food Bank helps fight hunger in North Iowa. 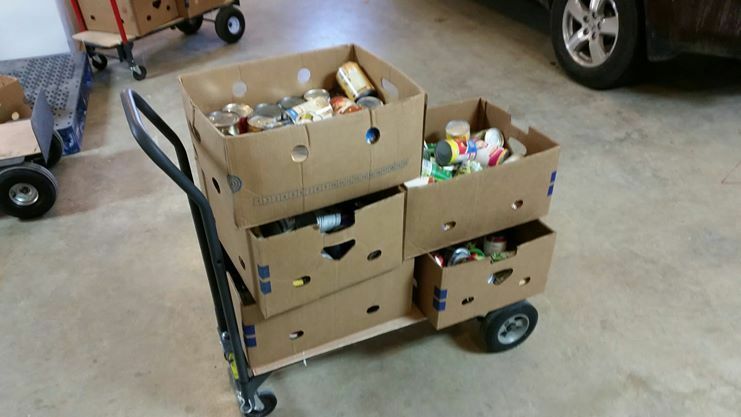 Our adult Sunday school class collects food for the food bank on an ongoing basis. Bring your canned and other package food items to the church at any time and place them in the baskets located at the southeast corner of the sanctuary. “Women at the Well is a United Methodist congregation which is located within the walls of the Iowa Correctional Institute for Women,in Mitchellville,Iowa…. We are a diverse community composed of women incarcerated at Iowa Correctional Institute for Women, men and women from around the State of Iowa who choose to worship with us,and many volunteers who regularly support our ministries and programs. We gather together to share the teachings of Jesus Christ,and to experience the life transforming Spirit of God.” To learn more, see the Women at the Well web site.